5% Off High Quality Sod. Call Now! Atlanta's Trusted Quality Sodding & Landscaping Service Serving All Your Residential and Commercial Needs! Call Now for Amazing High Quality Sod! A great lawn begins with high quality sod. A & N Sod Supply Inc is the established leader in sod and lawn grass for over 19 years. Our highly trained and experienced sodding crews will beautify your business or residence with impeccable attention to detail. Discover the difference in quality sod delivered straight from the farm to your door. 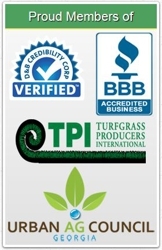 We're committed to using the highest quality sod available, with upfront pricing, and no hidden deposits or surcharges. Call (404) 448-1776 today for all your sod needs! Lawn Grass Sod Why Choose A & N Sod Supply Inc? Get A Free Estimate Today. Call Now! Copyright © 2018 sodsupply.net All rights reserved.